The Alpha Kappa Chapter. The 32nd House of Alpha. The Brothers of the Alpha Kappa Chapter of Alpha Phi Alpha Fraternity, Incorporated, have been in the Western Massachusetts area since it’s chartering in October 7, 1922 making it the oldest historically Black Greek Lettered Organization at any College/University in the surrounding communities. Alpha Kappa was founded on the precepts of community service, scholarship, and the continuous advancement of people of all ethnicities. The chapter has refocused its energies this year toward expanding its membership, while continuing to provide quality programs. 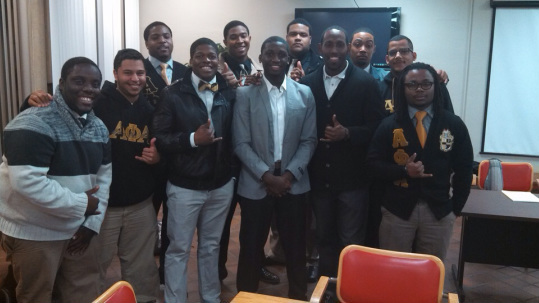 The Alpha Kappa Chapter was chartered by Brother Raymond Pace Alexander. There were bright prospects for the growth of this chapter, since it was to make contacts with several nearby schools. The charter members are Brothers H.A. Brown, J.H. Burr, W.T. Dixon, M.S. Duncan, D.E. Finley, S.L. Hasbrook, W.H. Mitchell, R.H. O'Blenis, and C.S. Stone. Since the establishment of the Alpha Kappa Chapter, 95 years ago, it has grown to encompass several colleges and universities in the Western Massachusetts communities. These colleges include the University of Massachusetts Amherst, Amherst College, American International College, Springfield College, and Western New England College. The chapter seat is now located at the University of Massachusetts-Amherst.